San Franciso is one of the world's best cities for restaurants. Having the kids in tow doesn't mean the adults have to give up on a great dining experience. Below is just a sampling of San Francisco restaurants that welcome children of all ages, from "squirming allowed" to "practicing grown up manners." For more dining ideas, visit www.sfvisitor.org or contact the San Francisco Convention & Visitor's Bureau Visitor Information Center for a current Visitor Planning Guide by calling 415-391-2000 or vic1@sfcvb.org. Decorated in the elegant décor of 1920s China, this is the only restaurant in Chinatown with private dining booths. 631 Grant Avenue, 982-3245. Serving up some of the most authentic (including hot and spicy) Hunan dishes in San Francisco, The New Yorker has called it "the best Chinese restaurant in the world." 110 Natoma Street, 546-4999. There's a lot to take in at this restaurant, whether it's watching the chefs work their magic or gazing at the sushi boats as they float by to tempt you. 389 Geary Street, 781-5111 or 781-1514. Sample some of San Francisco's famous dim sum at this landmark dating back to 1958. Yank Sing serves internationally acclaimed, award-winning dim sum, individually hand-crafted by skilled chefs. Two locations. 49 Stevenson Street, 541-4949 or 362-4799, One Rincon Center at 101 Spear Street, 957-9300. Zao Noodle Bar Providing a casual atmosphere infused with hip, high-energy fun, Zao serves up high quality noodle dishes inspired by the greats of Asian cuisine. Four locations. 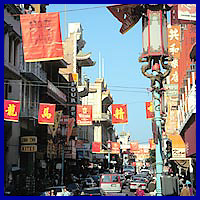 2031 Chestnut Street, 928-3088, 2406 California Street, 345-8088, 3583 16th Street, 864-2888, and 822 Irving Street, 682-2828, www.zao.com. Authentic southern immigrant Italian food is served family style in a kitschy and fun environment. 855 Howard Street, 543-POPE, www.bucadibeppo.com. Comfortable and convenient the California Pizza Kitchen features a variety of innovative pizza, pasta, salads and desserts. 438 Geary Street, 563-8911, www.cpk.com. A European bistro with specialties including pizza, calzone and more. Big windows and sidewalk seating provide classic North Beach people watching opportunities. 430 Columbus Avenue, 397-3600, www.calzonesf.com. San Francisco's most awarded pizza is delicious and generously portioned. Find them at one of four locations in The City: 1310 Grant Avenue, 433-2444, 715 Harrison Street, 371-0930, 800 Stanyan Street, 751-2300, and 1499 Grant Avenue, 433-2444. Catering to kids with a special menu and activity book, this Italian grill and American bar follows a simple vision: Combine good food, reasonable prices and a casual atmosphere in a downtown meeting spot. 129 Ellis Street, 392-5500 or (800) 669-7777. San Francisco is dotted with great pizza places. For a list, check the San Francisco Visitor Planning Guide (published by the San Francisco Convention & Visitors Bureau). 101 Fourth Street, 537-3400 or 369-6000, www.metreon.com. Metreon features a nice variety of restaurants to choose from including Jillian's, a great place to watch televised sports and play pool, and a tempting Just Desserts Café. Night Kitchen Café Themed after Maurice Sendak's Where the Wild Things Are, a unique dining experience for children. The menu caters to kids, serving treats and entrees they will love, as well as giant cookies waiting to be decorated. A fun and entertaining seafood restaurant based on the movie, Forrest Gump. Pier 39, 781-GUMP. A San Francisco favorite since 1928, this historic waterfront bar and grill has old time bayside photos lining its walls and great views of the bay. Pier 39, 433-3689. Especially for the chocolate lover, this is the place to indulge in decadent ice cream concoctions and rich chocolate confections. Take a tour and see original chocolate making equipment in operation. Ghirardelli Square, 900 North Point Street, 474-3938 or 771-4903, www.ghirardelli.com. Formerly known as the Alcatraz Café and Grill, Triggerfish is an updated and upbeat seafood, steak and jazz restaurant. Pier 39, 434-4424. Overlooking Union Square, the Cheesecake Factory has over 200 items available on its menu, including 40 types of cheesecake to choose from, in a casual and high-energy atmosphere. Macy's Union Square, 170 O'Farrell Street, 391-4444, www.thecheesecakefactory.com. Fresh, regional Mexican food and fabulous margaritas are served in a festive border-style atmosphere. Three locations. 201 Third Street, 543-8060, 590 Van Ness Avenue, 621-8200, and Two Embarcadero Center, 391-2323. Breathtaking views of the Pacific Ocean have made this restaurant an institution as it provides the perfect setting for a meal after a day on the beach. 1090 Point Lobos, 386-3330 or 666-4025, www.cliffhouse.com. The Smithsonian of rock'n roll provides quintessential American food at excellent value. 1699 Van Ness Avenue, 885-1699 or 885-1611, www.hardrock.com. The perfect solution for a unique dining experience during the day or the evening. Spectacular views, gourmet cuisine, and impeccable service are all included aboard an elegant yacht. Pier 3, 788-8866 ext. 2279, www.hornblower.com. Everything hungry patrons ever wanted to eat can be found in this authentic 1950's style diner and soda fountain. 311 Third Street, 546-6297 or 546-0168, www.citysearch.com/sfo/maxsdiner. New York style deli sandwiches, salads and succulent desserts are served by aria-singing waiters in a café offering everything from Puccini to pastrami. 601 Van Ness Avenue, 771-7300. Pacific Marine Yachts Dine on any number of gourmet delicacies while afloat on a yacht in the San Francisco Bay. Pacific Marine Yachts specializes in Brunch cruises and offers impeccable service to enhance the dining experience. Home Port Pier 39. Corporate Offices, 50 Francisco Street, Suite 120. 788-9100, www.pacificmarineyachts.com. For more information on events, activities, transportation and lodging reservations in San Francisco, visit www.sfvisitor.org. To make lodging reservations by phone, call (888) 782-9673 toll free within North America or 415-391-2000 elsewhere. San Francisco visitor guides are available at the Visitor Information Center at 900 Market Street at the corner of Powell and Market streets, lower level, Hallidie Plaza. To receive a copy by mail, call (415) 391-2000, write to the San Francisco Convention & Visitors Bureau, P.O. Box 429097, San Francisco, CA 94142-9097 or send your request by e-mail to vic1@sfcvb.org.